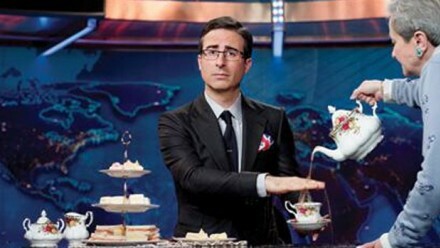 Have you been watching John Oliver’s takeover of The Daily Show this summer? Jon Stewart is still billed as host. John Oliver sits next to him at the desk. Jon Stewart still delivers his fine commentary on current events and the state of the world. Jon Stewart still interviews all the guests. And in between segments and as they go out for commercial breaks, John Oliver dances. That will be the perfect news show, don’t you think? Update: NPR published this interview with John Oliver the same day I published this post.